Joash is made king at only seven years old. NE OF THE greatest of all the kings of the Ten Tribes was Jeroboam the second. Under him the kingdom of Israel grew rich and strong. He conquered nearly all Syria, and made Samaria the greatest city of all those lands. But though Syria went down, another nation was now rising to power--Assyria, on the eastern side of the river Tigris. Its capital was Nineveh, a great city, so vast that it would take three days for a man to walk around its walls. The Assyrians were beginning to conquer all the lands near them, and Israel was in danger of falling under their power. One of the kings who ruled over Israel was named Ahab. He provoked the anger of the Lord. His wife, Jezebel, who was a worshiper of Baal, persuaded him to build an altar to the false god. 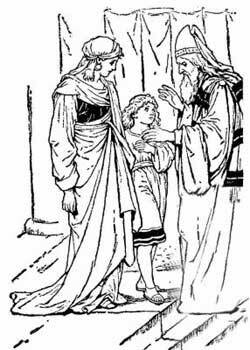 Elijah, a prophet of the Lord, was sent to him and proposed a test. Two altars were built; one to Jehovah and one to Baal. The priests of Baal called upon their god to send down fire; but there was no answer. Then Elijah called upon the Lord God of Abraham, Isaac and Israel, and fire came down and burnt up the offering. The people turned upon the priests of Baal and killed them all. Later the wicked queen, Jezebel, coveted a vineyard for Ahab, and she caused Naboth, the owner of the vineyard, to be placed in front of the battle. When he was slain Ahab took the vineyard. Once more Elijah came and denounced Ahab and Jezebel, telling them that they had done wickedly, and that the Lord would punish them. In a little while the prophet's words came true, for Ahab was slain in battle and Jezebel was put to death by order of King Jehu. Elijah was taken up to heaven in a chariot of fire. There was another prophet, a companion of Elijah, whose name was Elisha, a brave and courageous man who did not fail to deliver God's message. "My father, my father, you are more to Israel than its chariots and horsemen." "This is the arrow of victory; of victory over Syria; for you shall smite the Syrians in Aphek and shall destroy them." It happened as Elisha had foretold and the Syrians were defeated and their cities taken.